In this article, Dan sets the scene for the battle of Agincourt by describing the background to the conflict. The battle of Agincourt sits within a period called ‘the Hundred Years War.’ The name is a misleading one, as it does not refer to a continuous war, but instead indicates a period of repeated conflict between England and France between 1337 and 1453. The origins of the struggle went back centuries. The conflict between England and France began nearly 400 years earlier when the English were defeated by William, duke of Normandy, at the battle of Hastings in 1066. The Duke, a significant landowner in France, invaded England, took power and became king. Thereafter, the kings of England also owned and ruled over substantial parts of France. This inevitably led to tension with the kings of France. 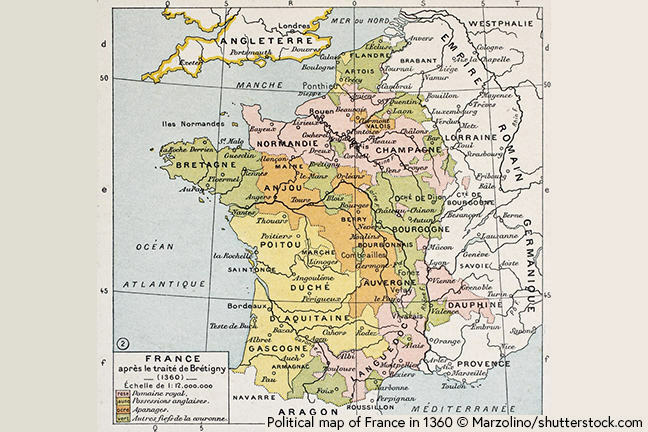 By the middle of the twelfth century, King Henry II, through inheritance and his marriage to Eleanor of Aquitaine, possessed extensive territories in France, including the duchies of Normandy and Aquitaine, and the counties of Anjou, Maine and Touraine. Almost all of these territories were lost during the reign of King John, however, which meant that by the middle of the thirteenth century, the English only controlled a diminished area of the duchy of Aquitaine, in the south-west of France. By the time that Edward III (1327-1377) came to the throne, English territory in France mostly centred on the cities of Bordeaux and Bayonne in the region of Gascony. A further complication in Anglo-French relations occurred with the death of Charles IV of France, in 1328. His closest male heir was his nephew Edward III (of England), who possessed a claim through his mother, Isabella, who was a sister of Charles IV. Yet this was disregarded by the French nobility, who instead crowned a cousin of the dead man as Philip VI. Edward was not in a strong enough political position at that time to make his claim on the French crown. Thus, he was forced to offer his loyalty and submission to Philip VI of France, in 1329. 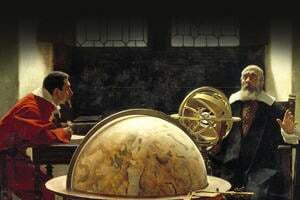 However, conflict between France and England broke out again in 1337. This was in part due to French support for the Scots, who the English were at war with at the time, but also due to French aggression. Philip VI had decided that the duchy of Aquitaine should be taken back from the English and on the 24th May, he set about sending an army to invade the duchy. Although the duchy of Aquitaine (in the South West) was the direct cause of war between England and France at this time, most of the early fighting took place in the North of France. The first part of the conflict saw a number of English victories, such as at the naval battle of Sluys (slois) in 1340, where an English fleet destroyed a larger French fleet. 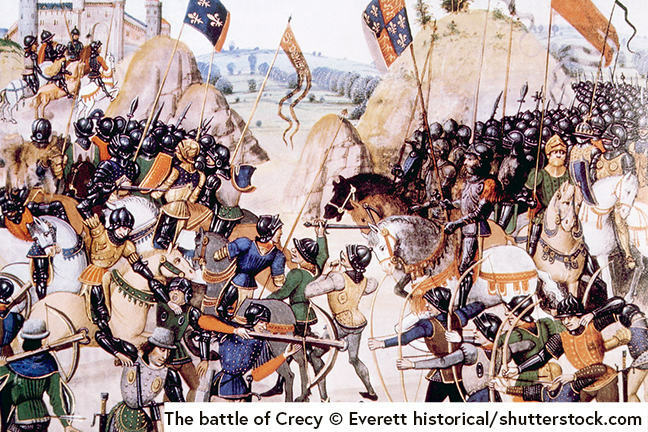 Six years later, the first major land battle of the war took place at Crécy in northern France, where an English army led in person by Edward III was confronted by a much larger French army, under the command of Philip VI. At Crécy the English archers were able to defeat the Genoese crossbowmen in French employ, due to the much greater rate of fire of the longbow, and they then achieved success against repeated cavalry charges by the mounted French men-at-arms. It was a great victory for Edward III’s archers and also for his reputation. 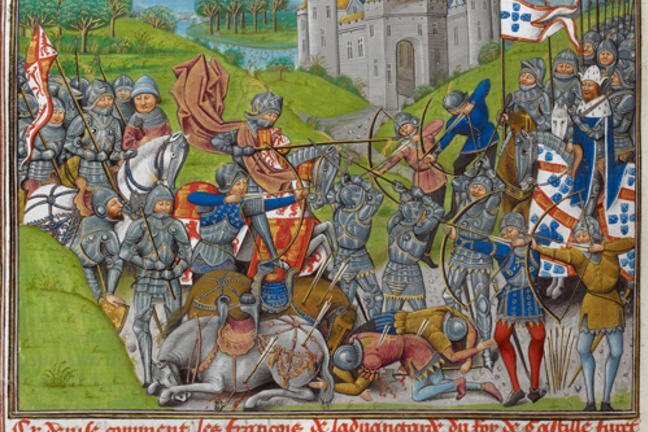 After this triumph, the French were far more wary about engaging Edward III in battle. From Crécy, the English army marched towards Calais. This Northern French port was strategically important due to its proximity to the English port of Dover. The English laid siege to the town and after nearly a year, were able to capture it. This was an important achievement which meant that until the loss of Calais in the 16th century, the English owned an important staging point for attacks on France. In 1355, after the events in Calais, activities in the conflict moved to South-West France. Edward of Woodstock, who was Edward III’s eldest son, led a grand chevauchée or mounted raid into French territory in Aquitaine. Nicknamed the Black Prince, he won a resounding victory over a far larger French army and captured its commander, Jean II, the King of France himself. Holding the king of France as a prisoner put Edward into a very strong negotiating position and as a result, the English were very much in the ascendant by 1359, when Edward III again invaded France with a large army. A peace treaty was concluded the following year, known as the treaty of Brétigny. As might be imagined, the terms of this treaty were very favourable to Edward III. In return for releasing Jean II from captivity and renouncing his claim to the French throne, it was agreed that Edward should receive a greatly enlarged duchy of Aquitaine in full sovereignty. However, war broke out again in 1369, and this time, was marked by a succession of French victories reversing almost all of the gains previously won by Edward III. 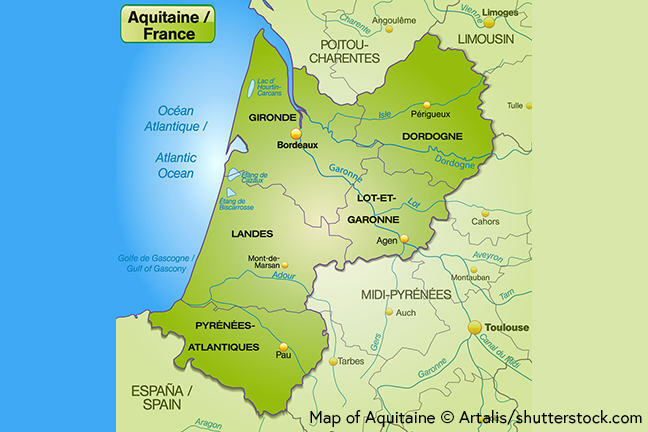 Much of Aquitaine was lost and successive English armies were unable to regain ground. This situation continued throughout the 1370s. Edward III died in 1377 and was succeeded by his grandson Richard II (1377-1399), as Richard’s father, the Black Prince, had died the previous year. By the mid-1380s, the political situation in England had deteriorated and the English faced the prospect of a French invasion, with two attempts made in 1385 and 1386. 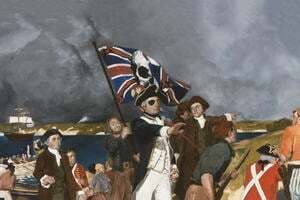 In the event, neither expedition was launched against England, but it highlighted the country’s vulnerable state. Indeed, in 1387, Richard II’s authority was challenged by the Lords Appellant (a group of powerful noblemen) and he was close to being removed from power. He managed to regain his authority but recognised that a settlement with France would enhance the stability of his situation. 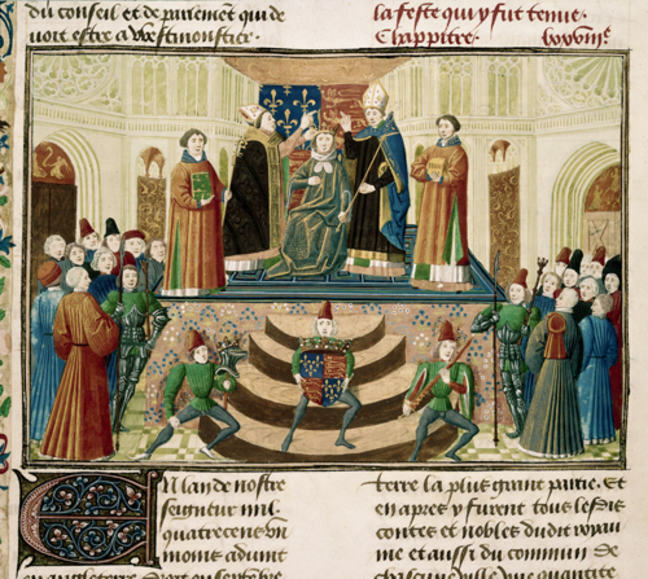 The Truce of Leulingheman was duly agreed in March 1396 and it was decided that Richard should marry Isabella, daughter of the king of France, and that the two countries would agree to observe peace for a period of 28 years. English territory was limited to a small part of the duchy of Aquitaine and the town of Calais. However, the chance of securing a permanent peace – or even 28 years of peace - between England and France was made more difficult due to the deposition and murder of Richard II in 1399. Richard was killed by his cousin, Henry of Bolingbroke, the earl of Derby, the son of one of his other uncles, John of Gaunt, duke of Lancaster. 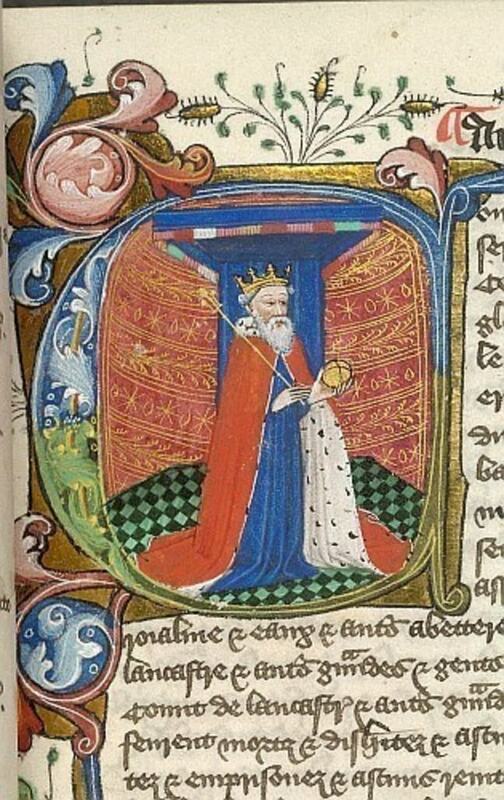 Henry took the throne to become Henry IV. The murder of Richard II was seen by the French as an aggressive act against them. They felt that it signalled a clear desire to resume hostilities and so despite the truce, the French launched attacks on Aquitaine and Calais in the early 1400s. As well as conflict with France, Henry IV’s reign was also marked by the outbreak of major rebellions in the north of England, led by the Percy family, and in Wales, by Owain Glendower. 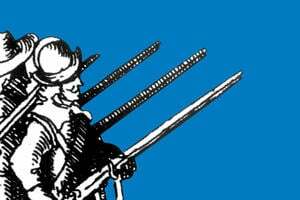 At the battle of Shrewsbury in 1403, a royal army led by Henry IV was confronted by a rebel army commanded by Henry ‘Hotspur’ Percy. The royalists were ultimately victorious, and England and Wales were largely at peace by the death of Henry IV in 1413. In France meanwhile, the situation was very different: King Charles VI had begun to experience serious bouts of insanity and different groups were vying for power. Civil war had broken out between two groups known as the Armagnac and Burgundian factions and France was in turmoil. This meant that the new English king, Henry V, was in an excellent position to intervene in French affairs. The stage was set for a campaign to regain English lands in France. Sumption, J. Cursed Kings: The Hundred Years War IV (Faber & Faber, 2015). This link takes you to Amazon.co.uk.